Sorry I've been rather quiet on the blog as of late. We have been working on a few projects and life has been a little hectic so the crafting or motivation to even craft, has been a little slacking. One of the projects we have been working on though is a little update to our foyer area. If you missed our entire foyer/living room project you can check out what we did here. 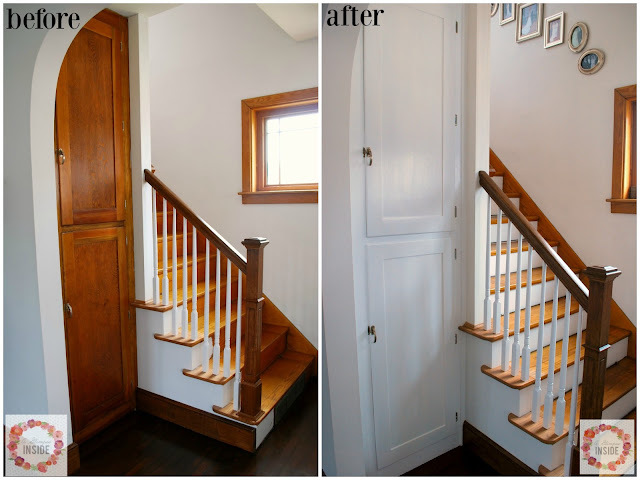 When we first completed our foyer there were two projects that we knew we wanted to get done but it was just a matter of when we would actually get to them. 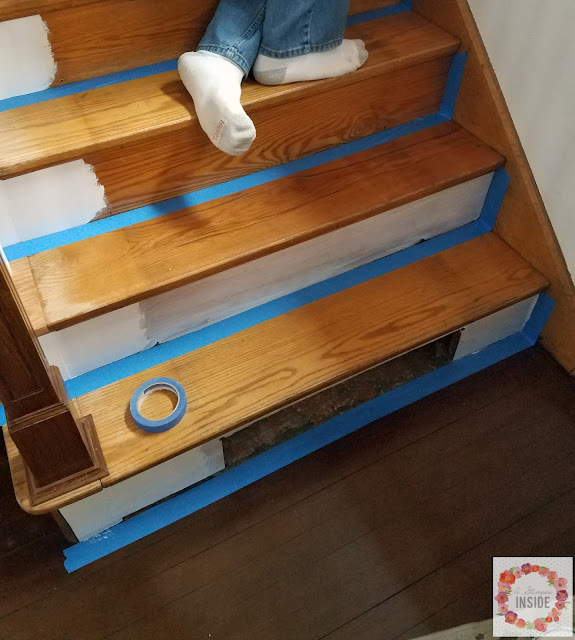 We always planned to paint the stair risers, hence why I painted into them a little ways when they built the stair extension for the railing. And we also talked about painting the cabinet in the foyer as well since there was so much wood in such a small area with the dark stained front door, stained floor, steps, trim, and then the cabinet itself. We were going to take a quick trip to TN but canceled it so Travis still took the days off he asked for and we finally knocked the stair risers and the little cabinet off our to do list. And now I wonder what the heck took us soooo long! Before I show you the finished results I will share with you what we did. 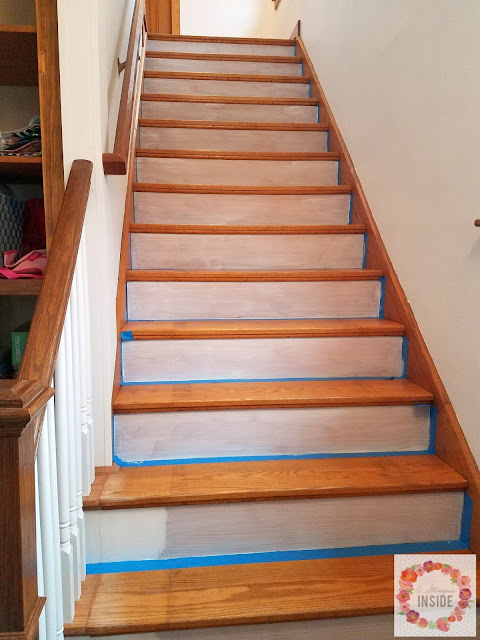 Travis gave the stair risers a light sanding then I came in behind them and gave them a good wash.
Once the stairs were dry, Travis taped off the stairs. I then gave the risers 2 coats of primer before painting 3 coats of the main paint. We took off the doors to the cabinet and took them down to our work room in the basement where I sanded, primed and painted them while Travis added some new trim around the cabinet and I later primed and painted the body of the cabinet. 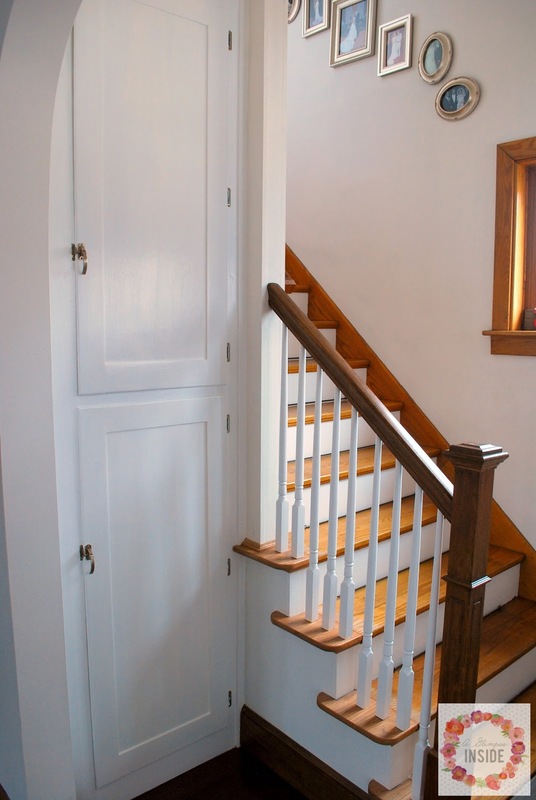 Nice bright white cabinet and stair risers break up all the orange stain on the steps perfectly! I love how the stairs turned out, now if we could only get the stairs finally clean from the old carpet runner that was on them, but we'll get there at some point. 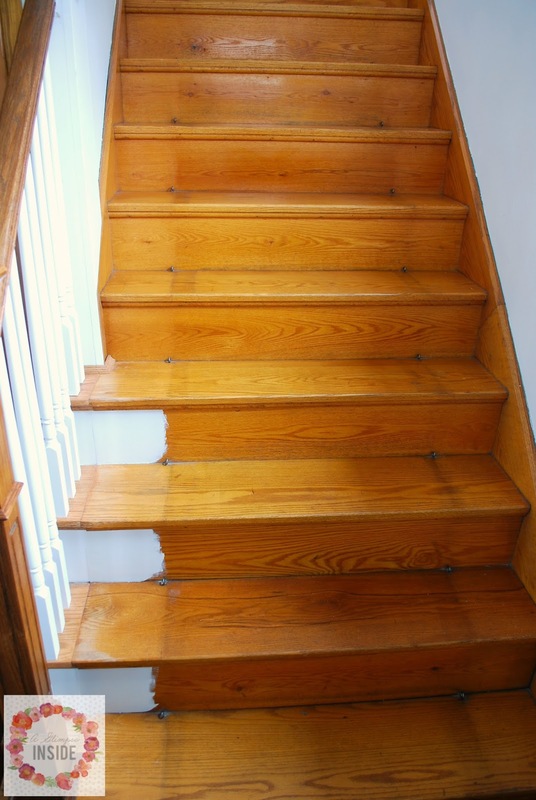 We kept the metal bars on the steps that hold down the carpet runner in place just in case someone in the future wants to replace the runner. 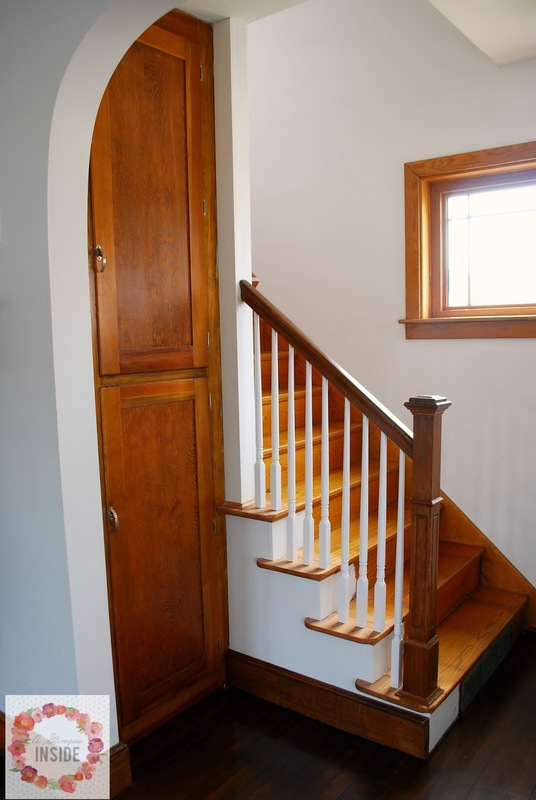 This also made us realize how much we need to do this to the back stairs of our house. 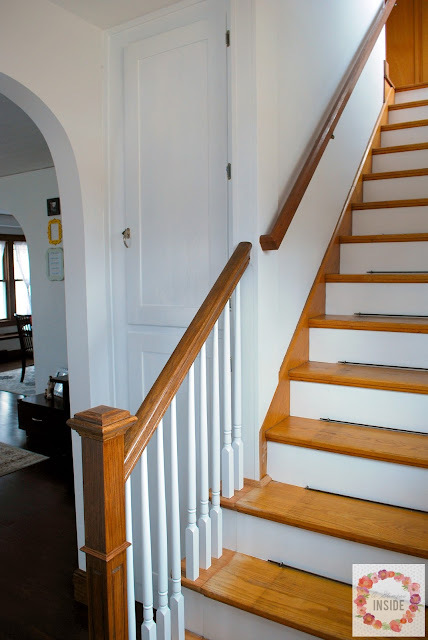 It is just a staircase in a little hallway so it the white will definitely brighten it up from all the stained steps. This space is now so much brighter and I'm in love! I am still shocked when I walk through there and how much brighter it is and I wish we did it sooner. Now onto to finishing the other big project we started the same weekend Travis was off of work! 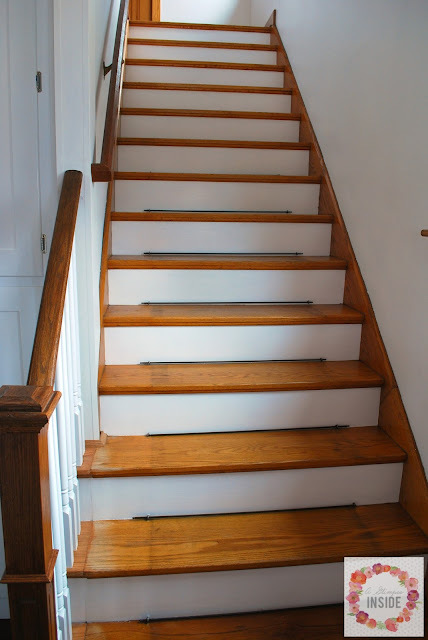 Allison your stairs look gorgeous! What a difference!!!! Love it! Love the brighter look. You did such a good job!